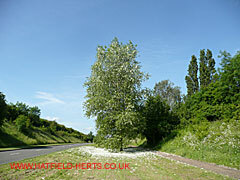 This section contains photographic images of trees found in Hatfield. Apart from their natural beauty, trees are hugely important in producing oxygen, providing habitats for birds, insects and small mammals. 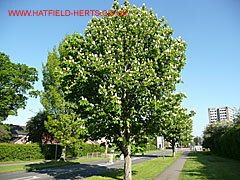 Along with native tree species, Hatfield also has a number of exotic imported species decorating gardens, kerbs and roadsides. 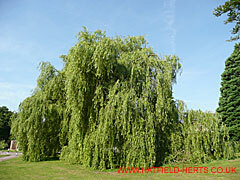 Weeping Willow (Salix family) – probably a Golden Weeping Willow. It is a deciduous species – meaning it sheds its leaves in autumn. 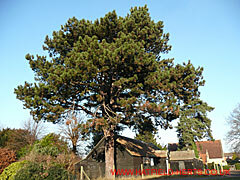 Scots Pine (Pinus family) – one of the native species. It is an evergreen, as the name suggests it keeps its leaves all year round. Oak (Quercus family) – there are some 500 different species of Oak. 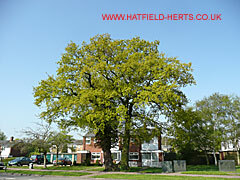 Hatfield has a number of fine examples of Oak trees but this one is stands out as it has a twin trunk. The light green leaves show the picture was taken in Spring. 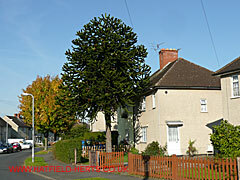 Monkey Puzzle (Araucaria family) – native to Chile but there are at least three growing in Hatfield. The species was around when dinosaurs ruled the planet. Introduced to Britain by Victorian explorers. Incorrectly called Monkey Puzzle as they thought the smooth trunk would defeat a monkey's attempt to climb it (no monkeys in Chile). Horse-chestnut (Aesculus family) – originates from the Balkans but planted widely throughout Europe. It is deciduous and its fruit is a nut called the conker. Shown here in bloom – flowers are a white with a hint of pink. However, Red Horse-chestnut (crossed with an American species), which can also be seen around Hatfield, has pink flowers. Poplar or Aspen (Populus family) – deciduous tree. In this case thought to be a hybrid Black Poplar. What looks like snow at its base is actually cotton wool-like seeds. If you suffer from hay fever (often a tree pollen allergy) then you need to exercise caution at certain times of the year.